This entry was tagged applications, applying for jobs, committees, faculty, job searches, R1 vs non-R1, service. Grabbing the brass ring involves far more luck than skill. I know this from experience. Have you ever grabbed the brass ring? I mean, actually, a real brass ring. Do you know the origin of the phrase? There’s a gorgeous carousel in San Diego’s Balboa Park, more than a hundred years old, with most of the original parts intact. I’ve rode this carousel on occasion. This is one of relatively few places that still runs the classic ‘brass ring game’ that used to be a common feature of carousels. If you ride on the outside row of the carousel, then you have the opportunity to reach out and grab at an apparatus that delivers metal rings. Most of these rings are made of iron or steel. If you grab a one of those rings , then you can just toss it at a target. 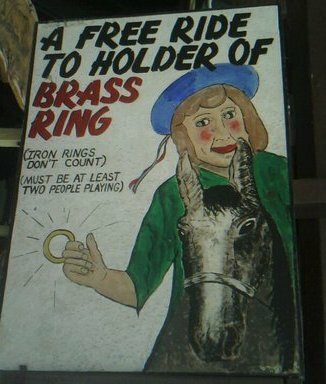 But if you grab the brass ring, you get a free ride. At least, that’s the prize in Balboa Park. It takes a little bit of effort and dexterity to grab the ring. You’re going by pretty quickly, and you’ve got to hook your finger in just the right spot. But it’s mostly about being at the right place at the right time. There are lots of riders who grab rings on the carousel. It’s not that difficult if you’re trying to do so and you ride several times. So, when you get the brass ring, it’s mostly luck that you happened to be there when it came down. I used to think that “grabbing the brass ring” was a phrase that referred to some kind of prize or some kind of achievement. And it is, but for anybody attempting to grab it, whether or not you get it is mostly luck. If you keep riding the carousel, then odds are you’ll grab a ring. This is a germane analogy for the academic job market. Of course, some people are far more likely to get offers than others, based on their application materials. But once the short list gets drafted, well, everybody’s on a horse in that carousel, and someone’s going to grab the brass ring. There are lots of things that can affect the timing of when that brass ring is dropped, but it’s not under the control of the person riding the carousel horse. This entry was tagged applying for jobs, careers, job searches. My department is hiring two biologists. What field of biology? You name it! The department has a broad variety of needs. Some ad text is below, which provides the basics. Note that application review starts in late October. The Department of Biology at California State University Dominguez Hills invites applications from individuals for two Tenure Track Assistant Professor positions, open to all disciplines of biology, starting August 2014. We are seeking two biologists who have passion for teaching biology and conducting research with undergraduates and Master’s students. A Ph.D. in biology or a related field is required. The applicants must possess scholarly and professional competence as demonstrated by a record of research publications and have demonstrated potential for effective teaching of undergraduate and graduate courses. The applicants must have demonstrated ability and/or interest in working in a multiethnic, multicultural environment. Teaching responsibilities may include general education, introductory biology, non-majors courses, and upper-division and graduate courses in the candidate’s specialty. The positions require the establishment of an active research program, as well as service to the university. The Department of Biology offers four baccalaureate programs, an M.S. program, and two Minor programs. Recognizing the crucial role of research in science education, the Biology Department is committed to offering research opportunities to all interested and qualified students. Review of applications, consisting of a CV, cover letter, teaching and research statements and a list of 3 references, will begin on October 23, 2013. To apply, submit materials through http://www.csudh.edu/employment/ and additionally send all materials as a single file to biologysearch@csudh.edu, instructing references to send letters to biologysearch@csudh.edu. This entry was tagged applying for jobs, job searches. Last week I interviewed for a faculty position in Sweden. Given that it is my second of such interviews and that the process has had me fairly distracted me, I thought I would write about how it works. This might be of interest to those applying for these kinds of jobs or as a comparison to other systems. I was certainly surprised by the process when I first applied because it was such a stark contrast to what I expected from North American hiring. Applying: First, in my experience applying for a position in Sweden takes much longer to put together than a North American tenure track job. The application process is all on-line with various attachments, rules, and instructions. The general requirements are similar; you need to present your CV including teaching experience, publications (ten are attached), research plan and teaching philosophy. However, how these pieces fit into the various components can be different. The devil is in the details. For example, in my recent application there were no fewer than three places that I was to enter something about students I have supervised. It was challenging to know exactly how these should differ as well. Further, teaching was broken into experience/merits, supervision and a self-reflection on the role of a teacher (all separate sections). There was also a section where you were to describe your personality. This also came back in the interview process where all candidates were asked to describe themselves in one word. Quick, try to answer that one without dwelling on the positives and negatives of any given word too much (I answered optimistic). Another big difference in the application process is that letters of recommendation are not requested, only contact information (perhaps to avoid wasting people’s time?). Publications are of course in your CV and you attach 10 publications but you also need to describe your role in all publications you attach and your motivation for choosing those 10. After you send in your application, you wait, but we (the applicants) were given a timeline of when the decision about interviews would be conducted shortly (~one week) after the closing date. Thus you know precisely how long to wait (about three months). Unlike North American jobs where it is sometimes unclear what stage the search is in, all the applicants receive the information at the same time. The interview/review committee: in an effort to control nepotism in Sweden because it is a pretty small country, departments do not actually decide who is going to be hired, even for permanent/tenured positions. The idea seems to be that they want the best person for the job and that an independent panel can assess that. It is also so that people can be judged fairly. At a certain point it seems difficult to do this and tough when some candidates are known in the department (with so few universities, it is not uncommon for people to have done their PhDs or post docs in a department they are applying to). So although I haven’t seen the interview process from the other side, my impression is that although fit seems to be considered, no one making the decision has a vested interest in who is hired. Depending on the university the committee can be from across sciences or a more narrow group (within biology, for example). Externals are brought in to review all the candidates first and determine the five (at least in both of my experiences) who are invited to interview. For my non-tenured position there was one external reviewer, two for the tenure-track position. The external reviewers do not have a final vote for the candidates but inform the decision. There are also student representatives on the board and others representing the union, for example. So far, one interview brought in the external reviewer for the day while the other did not. The interview: The interview is short, over the course of a single day, with all five people interviewing on the same day. The interviews are back–to-back (with coffee breaks (fika) and lunch, of course! This is Sweden after all). You have a short presentation of your work. Seriously short—in which you should discuss your research program, short and long term goals and demonstrate your teaching abilities (“The candidates are requested to prepare a 20-minute presentation of their research program and plans for the future, emphasizing both short- and long-term goals. This is an opportunity for the candidates to demonstrate their teaching skills”). Yeah. My experience has been 15 mins for the non-tenured position, 20 for the tenured (but maybe a difference of the universities rather than the position type). In the interview for my current position, the talk was only for the committee and was immediately followed by a ~30 min interview. The one I just did had a 20 min talk followed by 5 min of questions; it was open to the public but in practice was mainly attended by the committee. The interview for the tenured position was in the afternoon for 45 mins. Fairness is taken very seriously here so they keep to the time. It seems that the same basic questions are asked to all candidates with some variation. Mostly these questions are not about your science but about everything ranging from teaching, conflict resolution, how do you see yourself in the department, etc. Following all talks and interviews, the committee sits down and ranks the five candidates. The day: unlike North America, you don’t end up meeting with people in the department in an official way. Both my visits included a tour of the department and meeting with the department head but the people who you meet will not influence the decision or even have an opportunity to do so. It also means that you often meet the other candidates. This last interview was even strange because I collaborate with two of my fellow interviewees. Like I said, Sweden is a small country. So all the candidates had a joint lunch together with a few people from the department. The wait: Waiting for an answer is also short. Generally the committee decides on the day and they will let you know within the week (<24hrs for one and <48 for the other). Unlike in North America, the process is transparent. So you receive the comments by the external reviewers (this is for all the candidates that apply) and all candidates are informed of who is invited for the interview and then they also receive the final ranking of the interviewees. So you immediately know not only whether you got the position but also where you rank compared to other candidates. All the other candidates also know this about you. So that can be a little disconcerting. However, despite being transparent, you really have little idea about why you are ranked as you are. The external reviews reflect two opinions but don’t tell you how the committee considered them. As for the final assessment, there was no real indication of why they made the final choice. So similar to my impressions for NA position, you are left to wonder why you weren’t given the job and whether or not you should have done something differently. I was the top choice in my current position (few people refuse offers here, maybe because there are so few) and I was down at the bottom for the latest (they ranked the top three). Tough to know why and now it is time to lick my wounds, reflect on what I have learned, and get back to work. I’m grateful for two more years of salary to do just that. This entry was tagged applying for jobs, interviews, job searches, Sweden. Pretty much every faculty job application requires a Research Statement. It could be called something slightly different (research plan, statement of research interests), but they’re all pretty much the same. The research statement that you send to a research university has to be fundamentally different from the one you send to a teaching institution. When you’re applying for a job at a research university, your research statement should explain that your research is academically exciting, you are a current or future rockstar, you’ll bring in a more grant money than a minor deity, produce a ton of prestigious publications, train amazing doctoral students and your research fits well into strategic emphases within the department. I guess. I’ve never been on a search committee at a research university. If you sent that that message to a teaching institution, you wouldn’t make the shortlist, because you wouldn’t fit in. What messages do you need to send to a search committee at a teaching institution in your teaching statement? You don’t need to overtly state the above points, but they all should be things that an informed reader can easily infer. Teaching institutions want to hire the best researchers that they can. However, departments don’t want to hire someone who they aren’t sure can’t run a successful research program while teaching the standard teaching load. They don’t even want to waste an interview slot on that kind of person. You want to make sure that your application doesn’t communicate, by inclusion or omission, that you might be someone who can’t teach a lot while doing research with students at the same time. But most applicants lack that kind of experience. This is not a handicap. Search committees can’t use past performance to evaluate how someone will do research in a teaching faculty position. Instead, they can size up the attitude of the applicant. When you write about how you mentor and do research, does your approach look like something they think would be successful? Those things matter, a lot. Unfortunately, you don’t really have any control over either of those two elements. But what you can do, for the second element, is to make sure that the attitude in your application fits what you know of the institution and what might be more generally applicable to many teaching campuses. One approach that can work well is to build your research statement around a five-year plan. You don’t have to call it that, but it should communicate the scope of how much work you’ll do before you submit your tenure file at the start of your sixth year. If you project much further into the future about what your research goals and interests are, you’ll sound unrealistic. If you don’t look ahead for multiple years of research, then you’ll appear unfocused. You shouldn’t describe specific experiments, but you should describe lines of research, where they’ll be going, and what you expect to discover. One focal point of your research statement needs to explain the role of undergraduates. What is your mentoring style? How you do identify and recruit students for your lab? What are your priorities for student development? How do you design projects so that there are meaningful roles for undergraduates? These things are important. The fact that you place undergraduate mentorship inside your research statement is, itself, an expression of your priorities. Like all other parts of the application, you’ll be more successful if you honestly communicate your priorities and goals. This will not only result in the right institutions picking you for an interview, but it also will have the added benefit of making sure that you will be able to fulfill the expectations that you create. You don’t have to think too big or claim to be running a research program that will transform your discipline. You just need to get pubs out once in a while with student coauthors, mentor undergraduates in research, and hopefully get a grant. Put yourself in that mindset while crafting your research statement and you are more likely to have an ethos that will fit with the departmental mindset. This is a follow-up to an earlier post on how to look at a teaching institution to find out if serious research is possible on campus. One main point was that you can’t diagnose whether or not you will be able to run your research program at a teaching school until you have some direct experience with the campus, like you’d get during an interview. So, in this post, I discuss how to handle plans for serious research during the interview. The culture of research on a campus isn’t predictive of how much research that you personally will be able to get done. Before you interview, you need to be able to envision what your research program will look like and how it will operate, so you can know if you will have what you need to flourish. At most teaching campuses, you’ll have few to no specialists in your field. So you should market your research program not with the potential for scientific discovery, but instead with the great opportunities that will be created for students. The more specific you describe your plans, the more opportunity that others have to identify a perceived mismatch. Ignore advice on how to succeed on a particular campus unless it comes from someone who is very successful at that institution. 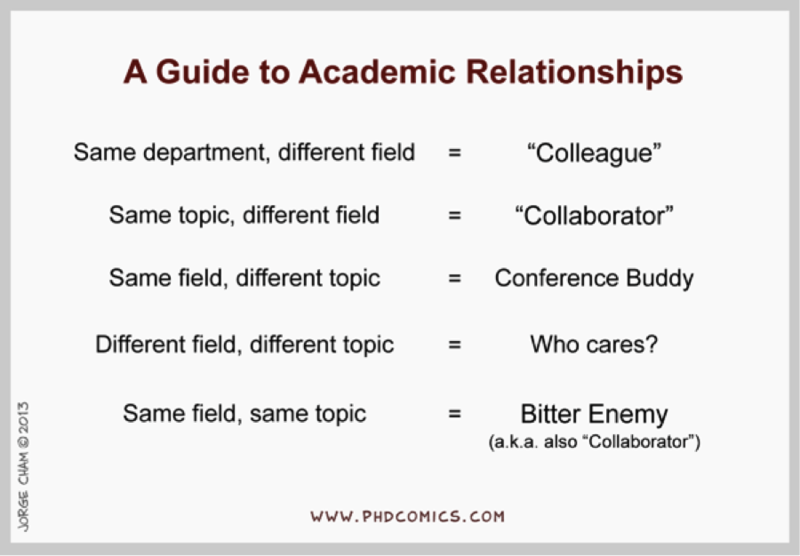 The best way to figure out whether or not you could run your research out of a particular campus is to have a series of long, frank conversations with the faculty in your prospective department. Those conversations aren’t going to happen; you can’t be that frank and I doubt your interviewers will be either. Your interlocutors may be wholly frank, but it’s not always possible to tell if this is the case. Be honest, but omit unnecessary details. Let’s say you arrive for your interview with a very specific idea of what your research program will look like, and what it will take to succeed. Or, let’s say you don’t have a specific idea but you are open to a variety of approaches. In either scenario, you’ve got a problem during the interview. You won’t be able to spend the 1.5 days on campus smoking out all of the details about how you would run your research program. There is a lot of ground to be covered in an interview. You’ll be expected to talk a lot, answering questions that the department has about you. Many of these questions will be about teaching, some will be about your research, and more about how you engage students in research. You also will be expected to ask a lot of questions. However, the majority of questions that you ask should be about teaching, because the institution is, after all, focused on teaching. Remember that your ideas about research are probably very different from the people who have worked on this campus for a while. Your definition of being an active scholar is probably different from theirs. You lack the campus frame of reference. You can’t accurately perceive that frame of reference through a mere conversations. It actually takes years to figure out a campus. You can attempt to construct a makeshift understanding of the campus research culture by reconciling what you hear and see on an interview with external information. You should be aware of what everyone is teaching, research specialties, and levels of research productivity. You can’t look at everyone’s CVs, but you can look at their websites and do a literature search before you go on an interview. Then, you can search for consistencies and incongruent conceptions. In my experience, the people who spend the most time talking about research during an interview are the ones that do the least amount of research. I’m not entirely sure why this is the case. Most people are excited to learn about your own research and see the interview as a learning opportunity, and this is true regardless of one’s research activity. Some people who aren’t serious researchers think that they are, and want to have a heart-to-heart talk about what it takes to do research on campus and how to overcome obstacles. For the most part, the others in the interview are trying to convince you to take the job, assuming that you get the offer. So, they are working to make sure that you have a realistic view of the situation while also understanding the available opportunities and resources. This sales job by the department is based on their incomplete understanding of what your research program requires. The more the department knows about what you need, the more they can inform you about the advantages and drawbacks of this particular position. However, the more the department knows, the more likely they will identify ways in which the job won’t work for you. Keep in mind that what a person chooses to discuss doesn’t communicate personal priorities. Most people are trying to provide interviewees with as much information as possible, in a positive light, to be able to help everyone make the best decision. Some might be emphasizing a sales job to convince an applicant to come, and others might be trying to be evaluative of the job candidate to see if they have the right answers. Everybody is different. I have always made a point to ask a couple questions of many different people in the department, and it’s been very informative to see how responses vary among individuals. It might be “How do you find students to work in your research lab?” or “What is it like working with the grants office?” or something about the level and predictability of small-scale internal research funding. Be sure to listen to questions you received. For example, when I interviewed for my last job, nearly everyone asked me at one point or another, “What do you think about the idea of having a graduate program in the department?” It didn’t take long to identify the majority and minority factions in the department. This was an indicator of a division within the department that I learned about during the interview. It was complicated and I didn’t have all of the facts, but I saw that the role of research in the department was a fractious issue, and I went in with that concern in mind. You’ll never get to understand the individual priorities that each professor has during a search. Most faculty are just looking for a colleague who can teach well, get research done with students, be effective, is easy to get along with, and won’t leave for another job. Some faculty might be concerned that junior faculty will raise the bar on research expectations. Some faculty will want new people to relieve them of teaching or service assignments of which they’ve grown weary. Others might want a friend. Too often, people want to have their own pet statistical consultants. These little quirks vary and you can’t really predict or control for them. Regardless, you should realize this much: very few faculty at teaching institutions are actively excited about hiring junior faculty who are planning to have extremely robust research agendas. Most people at teaching campuses see those big research ambitions as a poor fit, and think that those people belong at R1 universities. So, there is little to be gained by explaining that you have big research plans, if you have them. Of course you need to communicate that you will be getting research done with students, publishing, and plan to land outside grants. But you don’t want to make an overly big deal about research. Am I overstating the lack of interest in research in job candidates at teaching campuses? I don’t think so. I’m as gung-ho for research as anybody on my campus. But whenever we get to make a new hire, is it important to me that this new person builds a productive research lab? Not really. I would like it because it would help enhance the overall research climate in the campus, but we have many more pressing immediate and long-term needs, dealing with the curriculum, departmental service, advising, vetting out jerks and finding someone who is truly student-centered. If a productive research lab run by a new hire isn’t my own priority in a search, it’s probably not a top priority of other reasonable people who aren’t working to actively promote research on teaching campuses. Here’s another quirk of teaching campuses: Because research is mostly a solitary endeavor (because each campus typically has only one person in each specialty), then the professors on campus who talk a lot about research are prone to be seen as narcissists or out of touch with others. If you talk too much about your research during an interview, then you risk sounding like one of those narcissists. If you’re asked about your research ideas or plans, give a 30-second summary. Elaborate when asked, but you shouldn’t be giving a reply that takes more than a minute or two unless you get clear verbal or nonverbal cues to continue. That’s true for almost every question, but it’s particularly important to remember to be brief about your research. After you’ve done your best to understand the research culture during an interview, then you need figure out how, or if, you research can fit in on the campus. Remember that the absence of a research culture doesn’t preclude the establishment of a productive research program. It just means that your productive research program wouldn’t matter much to anybody, or it might even be threatening to others. While all kinds of support is wonderful, it’s perfectly fine if your research program is greeted with ambivalence. How can you tell whether an agenda for serious research will be greeted with antagonism? It’s not easy, and I got it wrong when I was interviewing. At a distance, if you were to look at my current and previous departments, it would be easy to make the mistake in thinking that research would have been more possible in my old job. People in that department published more often, and there was a lot more talk about research. The university was able to give every professor a few thousand bucks per year for research, paid for travel to conferences, and there was a university-funded student research program in the summer. What was less obvious to the casual observer is that there was clear antagonism to big-time productivity. There was one big-league researcher in my department, and he kept all of his research almost secret. At my current job, you might think that research is impossible. We have scant startup funds, very low rates of faculty publication, and no internal support for research or travel (though this year is an exception). However, a productive research program is far more possible in this job compared to my old one. Anybody who can build a highly productive research lab is more than welcome. That welcome doesn’t translate into more space or resources, but everyone is happy and that kind of thing is strongly encouraged. I didn’t realize this would be the case until I was well established into the job, and I’m very glad it has turned out this way. How can you figure out if a teaching campus passes the anti-research smell test? Or you could ask, “When is too much research a problem?” When approaching this issue, remember that you don’t want to be seen as overly optimistic, or naïve, or not interested in teaching. In sum, you need to be all about teaching, and that makes it a tricky dance to learn about true research opportunities. Because every faculty member needs to be dedicated to teaching above all else, you need to communicate this priority in the interview. I’m all about teaching and my students, but I’m also all about research. That idea is really hard to communicate in a short interview. You communicate your priorities with your words and your actions, and people expect them to match. To be successful in research, you need to forge your own path. This is particularly true at teaching institutions. To be continued: specific things to do, and specific things to avoid, throughout the job application process. This entry was tagged applying for jobs, interviews, job searches, R1 vs non-R1. Many people seek faculty jobs at teaching universities even though they would prefer to work at a research university. This isn’t unethical. A job is a job, and just because some people see a job as a calling or a sacred vocation, most people in the world are doing it for a paycheck above all else. Which is a more desirable job? Being a professor at a teaching-centered or a research-centered institution? What do objective measures say? There are two obvious ways to use numbers to answer this question. First, there is significantly more demand for the research faculty positions. Second, the salary of research faculty positions is appreciably higher than the salary of faculty at teaching institutions. More people want research positions. Maybe they’re not more desirable, but they are more desired. (This makes sense, because the training required for a faculty position is all about research training and typically includes no training in teaching whatsoever.) A number of scientists who are excellent in all respects, but still don’t get a research position, might wind up taking a job at a teaching institution, even though they may continue to pursue their primary goal of being a faculty at a research institution. Is this wrong? No, it is not. Nevertheless, because of the politics and emotions that people invest into their jobs, it is not socially acceptable at a teaching institution to communicate to others that your preferred job is at a research institution. This doesn’t require dishonesty, but it definitely means that you can’t be fully honest and you might have to be a little deceitful if this is your goal. You never want to say at your job that you want to eventually leave, after all, and this might even be true if you’re flipping burgers. Though more people want jobs at research institutions, jobs at teaching schools are still mighty hard to land. Given this keen competition, and the huge differences between what happens on a research campus and a teaching campus, teaching institutions get to have their pick of candidates and have the latitude to pick out job candidates who, more than anything else, want to be at a teaching university. Ideally, a campus wants to hire someone who isn’t immediately looking to leave. So, teaching campuses prefer to hire people who are dedicated to working on teaching campuses. That is, if search committees can identify who those people are. Good luck with that. Faculty who want a research position seeking a job at teaching institution, if they are to be successful, need to mimic the true believers who are passionately interested in spending their careers (if not their lives) at teaching institutions. To put this in context, let me offer a one-paragraph lesson in mimicry. In biology, we recognize a few kinds of mimicry. Batesian mimics falsely adopt the signal of another organism that honestly signals its status. (The classic example is a viceroy butterfly, which isn’t filled with toxic cardiac glycosides, but it looks a lot like a monarch butterfly, which picks up toxins from feeding on milkweeds as caterpillars.) In contrast, Müllerian mimics are only distantly related to one another but they have evolved a set of characteristics to honestly communicate their defenses. (The classic example is a set of mimicry complexes among Heliconius butterflies). Another kind are aggressive mimics, which could be predators that resemble their prey (such as jumping spiders that often look like their ant prey) or a caterpillar with a pattern that looks like the head of a viper, or a moth that looks like the face of an owl. So, when scientists who want research positions choose to apply for teaching positions, what kind of mimic are they? It varies. They could be Batesian mimics, which essentially are parasites on the system and reduce the effectiveness of the honest signal of the organisms that they mimic. These mimics don’t want to teach much at all, aren’t interested in developing that skill, and calculate the amount of effort they have to put in to just keep their job as long as necessary. They want to maintain this mimicry signal, and the quality of mimicry varies. They do hedge bets and are interested in being perceived as teaching-focused just in case they aren’t successful at moving on. Aggressive mimics of teaching faculty actively reveal their colors as soon as they’re hired. These people are toxic and everyone identifies the mistake right away. Including the person who took the job. Let’s forget about these, because they’re both rare and annoying people in general. There are Müllerian mimic professors, too. These are those that would prefer a job at a research university but they are also mighty pleased with a teaching institution too. They are showing their true colors when they say that they are dedicated to the teaching mission of the institution. They do belong, and they look like the dedicated faculty of the university because, in fact, they are. What is the relative proportion of the Müllerian and Batesian mimic varieties? Or, in other words, how many professors in teaching positions who want to move on to research positions are actually dedicated to doing a great job at their current institution? Here’s a question to which I do know the answer: Among the faculty who move on to research positions, how many of them were dedicated to doing a great job at the teaching institution before they left? That’s an easy one. In all of my experience, these people were wholly dedicated to their teaching jobs and before they left, they were recognized locally on their campus as spectacular in all respects before leaving. I’ve worked with and known a goodly number of people who have moved on from teaching jobs to research institutions (and there are a number of commenters on the site who fall that pool, some of whom I know well and some I don’t). In every case of which I’m aware, the departure of that faculty member was a great loss. These great losses were not the departures of the research programs, but because of excellence in teaching, collegial performance of service, and contribution to the institution as a whole. The departure of these people was seen as an inevitable “moving up” to bigger and better things. I’m not sure I agree with that assessment, but nonetheless people were uniformly happy for them. We all recognize that when dealing with employers, you need to look out for yourself above all else, as only you can be counted on to make choices in your own best interest, even if you have dedicated your career and then some to a specific institution. I imagine these professors who moved “up” to research jobs may have always wanted such a position, and they essentially published their way out of their teaching position. That’s the standard interpretation. However, if you choose that route, then my experience indicates that you can’t just publish your way out. You have to do it while earning the respect and admiration of your colleagues. (This is something that can’t be done by faking it. There are people on my campus who are faking it, and it’s pretty obvious.) You have to be dedicated and do a good job and have the interests of your students and your institution in mind. All of these people who I know that have made the move have been tremendously nice people above all other identifying characteristics. I’ve seen all of the above, and there are probably varieties I’m missing. Where do I fall into this pool? I’m not in this group – I deliberately looked for a teaching-centered position from the outset, even though my initial motivation in taking a job at a teaching institution wasn’t well informed. Since I am doing a decent amount of research at a teaching institution, is a research university a preferred job? I don’t think so. I don’t think I have a single ideal job. I do really want to go to a university where I can do more research and where it is valued, but there are lots of teaching-centered institutions that fit that label. I evolve over time, and my attitude towards research and teaching are very different from when I started out. I’m mostly satisfied in a teaching institution, and I don’t think I’d be more satisfied at a research institution. Nevertheless, I would consider a good move. There are a few crippling aspects of my current position that I would hope to ameliorate. First, I’d like to be in a department that is adequately staffed to support its own students; I am feeling increasingly guilty for complicity in an organization that is undermining it own mission. As a small example, it’s unfair to our students (as well as myself) that every professor in my department has >100 advisees every semester. Second, our campus research infrastructure is experiencing continued neglect, and the people in charge of promoting research on campus aren’t focused on what matters. (Last, and this isn’t a small thing, I would be nice to be paid market rate.) I’d have to be sure that a job I move into wouldn’t have other hidden problems that are worse than these ones, of course. If I do move, then I wouldn’t see it as “moving up” even if others at my university would see it that way. Most of my job is working with students, in the classroom, in the lab doing research, and in the field. That would happen wherever I go, and since I’ve been in my current job I’ve been blessed with a string of incomprehensively wonderful students. Every time I bring students to my field station in Costa Rica, my colleagues here uniformly remark, “you always have the best students.” And I agree with them. I’ve been blessed, and I doubt that blessing could transfer to a different institution. Ultimately, in my book, the desirability of the job is in how much I enjoy each day, on a day to day basis. It doesn’t matter too much if it’s a teaching or research institution. This is regulated by the collegiality and professionalism of my colleagues and the opportunities that are seized by my students. If you enjoy both research and the teaching, a true move “up” wouldn’t be about the relative emphasis on research or teaching, but the overall capacity to do both well. This entry was tagged careers, job searches, R1 vs non-R1.